If a resident needs access to your call system when they are away from their call point, these attractively styled pear leads are the perfect solution. They are available in 2-metre and 4-metre lengths and the right-angled jack plug reduces the chance of damage by furniture movement. Each unit is supplied complete with a clip fastener, so the unit can be attached to clothing or bed sheets if necessary. In the event that a lead is pulled out of its socket, a standard alarm call is generated. The pressure mat is placed on the floor and simply connects to your nursecall system activating a standard call when a resident steps on it. The unit comes with a four metre lead and plugs onto the call unit jack socket. The mat measures 300 x 600 m.m.. A larger, anti-bacterial version is available. An adapter is also available to allow the mat and call extension lead to plugged in at the same time. Designed to be worn by residents or staff, the unit can generated a Nursecall activation with the simple press of a button. This is especially ideal in large lounges or common rooms to generate an 'help' call, whereby it is possible not only to identify the call location but also the individual caller. Note: this is only usable on 700 systems. Designed to be worn by residents or staff and enables calls to be generated remotely from the call point. This is ideal outside or in lounges or common rooms where each resident can be given a trigger to allow access to the call system. The TRf4 requires an infra red or radio enabled call point to operate. When using the TRF4 with an integral 700 system, it is possible to identify the call location and the individual caller. 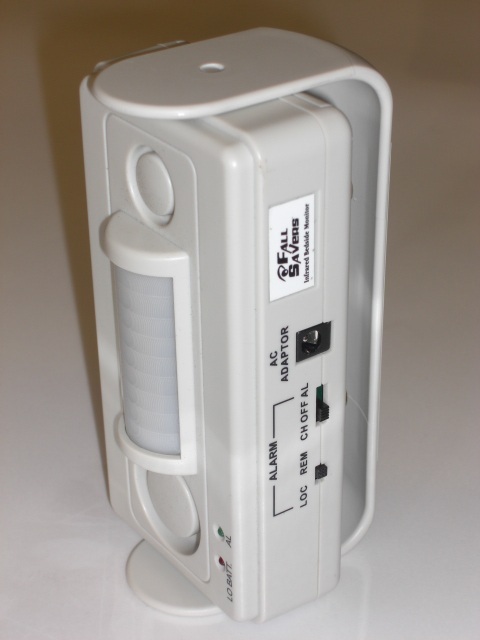 High quality and robust portable bedroom PIR sensor, complete with five metre extension lead for nursecall connection. Very simple to operate. Just plug into your nursecall system unit and press the silver button on the sensor before leaving the room. Ideal for monitoring bedroom doorways. This product is so reliable it comes with a 3 year warranty! Note, you can add the High Quality Portable Chair Monitor.